One of the most revered professions in the world today is that of the firefighter. Motivated by purely selfless compassion for their fellow human beings, firefighters place themselves in harm's way to extricate victims from a variety of hazardous environments. While society expresses gratitude and awe for these brave professionals, the perils of the job make fire service training crucial for the safety of both rescuer and victim. Firefighters must perform many duties throughout their careers (Essentials of Firefighting) The most widely publicized responsibility of a firefighter is of course to extinguish threatening blazes in any number of settings--townhouses, apartment complexes, detached homes, warehouses, and even wide open spaces. Possessing the expertise to recognize the chaotic patterns of one of nature's most destructive forces is not innate; indeed, that knowledge must be learned so that victims can be rescued and fire personnel leave unscathed. Firefighters must also be able to operate highly specialized machinery (Driver/Operator Training)--firetrucks, hoses, extinguishers, pumps, hydrants, etc.--with a dexterity that permits the quickest action in the most stressful situations. Emergencies never slow down while firefighting personnel struggle with the very equipment that is supposed to save lives. Training in the intricacies of these tools is absolutely essential to preserving life. Unfortunately, fires are only one of the many dangers that threaten life and property. Hazardous materials, natural disasters such as floods and tornadoes, and accidents are ever present in both small and large societies. As trained emergency medical technicians, fire personnel are able to treat critically wounded individuals, even after rescuing them from the very situation that caused them such harm. In addition to the observed work of the firefighter, there are many unseen expectations that a firefighter must maintain. With any incident, there will be reports that must be completed to record the event and the response. While any type of paperwork can be a bit tedious, such documentation is absolutely essential to the integrity of the system. Consequently, firefighters must know how to properly complete such reports. Equally important to the written report, firefighters must ensure that their minds and bodies are at peak levels of performance. Regular drills and physical fitness training become routine in the life of fire service professionals. Understanding the reason behind these measures, but also adopt the lessons learned from these experiences will guarantee that the firefighter is the best prepared they can be. Fire service training provides the solid foundation for such a meaningful career; in fact, the societies and victims that a firefighter will assist in the future demand no less than the very best training possible. Please contact us today to begin the exceptional training that will positively affect so many. Action Training Systems is far from the new kid on the block when it comes to developing courses for the emergency responder. Blending more than 25 years of experience with quality video content while keeping a focus on current national standards, our EMS Training programs have been approved by CECBEMS, the Continuing Education Coordinating Board for Emergency Medical Services. In a fast-paced world where time is always of the essence, Action Training Systems is a fast-track solution to a career in emergency services. Our interactive online courses combine technology with proven training methods that are designed for the next generation of emergency service leaders. With hours of training, the courses don’t cut corners on the essential knowledge needed to stay safe and treat patients safely on the job. 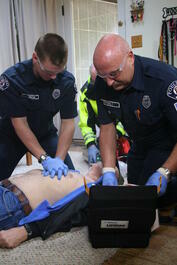 - Action Training provides the most comprehensive, up-to-date skills-based training as part of our EMS training series. Curriculum includes both EMR (first responder) and EMT level training, and teaches according to the most current, nationally recognized pre-hospital emergency medical guidelines. - All of our training objectives were developed in accordance with National EMS Education Standards and skills from the National Registry of EMTs. - All content and course oversight is provided by a program committee of qualified EMS educators, pre-hospital care providers and medical professionals. Remember, all Action Training Systems EMS online courses are approved for 1 hour of continuing education credit for emergency medical responders and EMTs. If you have questions, contact us today to speak to an account manager about your EMS training goals. Firefighters must be trained for so much more than fire fighting. As public servants on the front lines, firefighters are often the first on the scene for any number of cataclysmic events. One of the most common incidents that firefighting professionals encounter is car accidents; unfortunately, some of these accidents will require that victims be extricated from their vehicles. It is precisely such cases that call for the expertise only found in those who have successfully completed vehicle extrication training. Every accident has its own characteristics. The vehicle's make and model, the accident's location, the position of the vehicle, and the severity of the victim's injuries are just some of the factors that must weigh heavily on how the professionals address each situation; however, the result must remain the same--safely removing the victim from an entirely unsafe environment in an expedient amount of time. Stabilization has always been one of the first tasks for the responding crew, but today offers a variety of new products that more quickly and efficiently complete this step. Keeping up with this new equipment takes recent and specialized training. Just as with the stabilization devices, there is new glass removal equipment that allows the glass to be taken out in a more controlled manner so that neither the victim nor the responders are sprayed with additional glass. This equipment also allows the responders more access to the victim. Removing the door provides the best access to the victim, but each vehicle's make and model provides a different set of principles that must be employed. Where brute force may work okay in certain circumstances, finesse is better used in another. Crews must be trained to recognize which to use when. Like door removal, roof removal proves to be quite challenging. Where a door can possibly be removed by a single firefighter, a roof will require a team effort. Crews must be trained to recognize the sequence of cuts that should be made for successful roof removal. Once the door and/or roof is removed, it's not at all uncommon to find the victim pinned down by the dashboard. It is paramount that crews know how to handle this situation when it arises, and it will. Whether jacking with spreaders, rolling using rams, or using any other technique, crews must have the training they need to perform this task quickly and efficiently. At the scene is never the time to talk about theories that may or may not work. While the NFPA standards provide the principles and best practice guidelines for safely removing a trapped victim from a vehicle, those standards will not prove at all helpful without the proper training. Please contact us today to discover how our training arms all first responders with the expertise that saves precious seconds on site. Does your fire department believe that a large-scale hazardous material incident will never happen in your jurisdiction? In today's world hazardous materials are all around us. Most of America's hazardous materials and hazardous waste is transported across the country through small towns and large cities. So, any highway or railroad in your territory has the potential of becoming a hazardous material disaster site. Your firefighters are on the front line, the first on the scene at an incident that requires a knowledge of the poisons and chemicals they may encounter. Therefore, they will benefit with having Haz Mat Training. Hazmat awareness allows firefighters to interpret threats and warnings of the presence of hazardous materials in multiple situations. These may include fuel truck accidents and derailed trains which can result in leaks and spills that put at risk the health and safety of the public and the environment. With proper training, firefighters can learn to recognize if hazardous materials are present through basic clues and how they can be harmful if spilled or released into the environment. They can learn to recognize what places store or use hazardous materials and the type of containers that hold them. Haz Mat identification gives firefighters the ability to identify the material and take appropriate action. Training must include the marking signs for transporting hazardous materials and the nine hazard classes defined by the United States Department of Transportation. Firefighters should know how to use the Emergency Response Handbook. Giving your firefighters Haz Mat Training is giving them the tools to fight the enemy, the materials that can endanger their lives, the lives of their loved ones, and their community members. 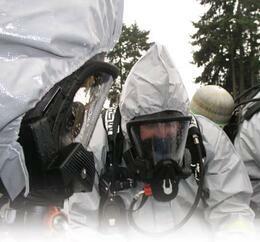 Action-Training has 4 HazMAt training series which are available online or on DVD. Simply contact us for more information on the courses we have to meet your needs. Firefighter Training - Do I HAVE to Manage Conflict? Yes! As a firefighter, you learned how to put water on fires. As a supervising fire officer, you need to become skilled at putting out a different kind of fire: conflict. Managing conflict is an essential leadership skill. You will want to learn how to manage all kinds of conflict – from petty disputes to major disagreements with the potential to derail your team’s success. Managing conflict is an unavoidable part of any supervisor’s job. Nobody likes conflict, but suppressing disagreements only produces frustrated firefighters and unhappy fire stations. On the other hand, a fire service officer who can confront conflict skillfully can turn it into an opportunity to help individuals grow and improve the organization. The first step to resolving conflict is being willing to intervene while others are still engaged in the dispute. When a conflict comes to your attention, you need to step up and offer a problem-solving approach. The second characteristic is the ability to model non-defensiveness. Collect personal feedback from those involved without getting upset yourself or taking anything said personally. In other words, be a good listener. All of the parties involved have information you need to find a constructive solution. Third, you will need to show patience. Make it clear that you are not rushing to quick fixes, but working to develop an agreement on how to resolve a problem. Fourth, show sensitivity. Show that you understand and accept the emotions that people involved express to you. Feelings of anger, fear or frustration are common. Fifth, as the leader you must always project optimism. Even though others may be seeing things negatively, you must keep your focus on the positive results that agreement and resolution will bring. Finally, one of the most critical characteristics for approaching conflict is maintaining credibility. Your trustworthiness is important. Be good for your word. Be consistently truthful and fair. And remember that integrity matters. After seeing these six characteristics for approaching conflict, spend a few moments reflecting on conflicts you’ve observed in the fire station. Mentally reviewing these experiences, how would you apply these lessons on approaching conflict? Characteristics and skills for approaching conflict are central to your success as a supervisor. You’ll find that these characteristics will serve you well every day in many situations. Why is Fire & EMS Training so HOT? Online learning is HOT and for a very good reason. Many departments and organizations around the world are turning to online training/learning as a way to decrease costs and improve the learners performance. Also, unlike a one-time classroom session, the online learning course is available to be accessed anywhere and can be reviewed a number of times to enhance the learners comprehension. 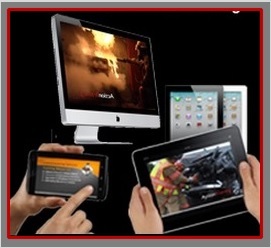 Many fire departments and EMS organizations are turning to online learning as a means to supplement their classroom training. Now, it is very important you understand that online training is not meant to replace hands on training, but simply be used as a tool to train students in addition to hands on and classroom learning. You can easily have your students login in from home and review or study material before coming to your weekly training night or before drills, so that the material to be covered is already fresh in their mind. • Improved training costs – Producing learning content is time consuming whether it’s online or not. With ATS Online learning, our course content is based on national standards and designed to follow training manuals by IFSTA/FPP and Brady/Pearson Publishing. With ATS Online, each time a course is accessed your return on investment improves because you are not limited by a classroom environment which means savings through decreased travel, reduced materials and improved (and more efficient) performance. • Increased productivity - Since ATS online is not bound by geography or time you can have control over when you want your students to take courses…during down time at the station or on their own at home . In addition, with the state of the current economy, we are continually being asked to do more with less. So ATS online is a great way to give students the tools and skills necessary to enhance their performance. • Standardization - Although you are an excellent training officer/course facilitator, there is no guarantee that the course material will be presented the same across all sessions. ATS online allows you to create a process where learning is standardized across sessions. With ATS online there will be consistency in delivery and content. • Improved retention - The combination of our high quality media and instructional design produces a very rich learning experience. With our interactive courses, quizzes and tests are available to help your learners retain the course content and better prepare them for hands on training and real world scenarios. • Real-time access - Live learning doesn’t allow for much flexibility. ATS online eliminates this because courses can be accessed anywhere, anytime on any computer or mobile device such as an ipad or smartphone. • Personalized Learning - ATS online allows you the freedom to customize your emergency response training to meet your goals for the day, week or year. You can purchase access to specific courses for a select number of learners based on your personal department/organizational need. This allow you control that you would not have in a classroom learning environment. • Ongoing access to courses/resources - If you take a class in the real world and need a refresher, you better hope that you took good notes. Otherwise, you’re out of luck. That’s not the case with ATS online. Ideally, you continue to have access to the online content and resources to brush up on what you learned and have the opportunity to share information as well. A few questions to ask yourself: What are your goals for your emergency response training? What type of training are you currently using? Are you completely satisfied with your current fire training or EMS training program? Is it efficient, without sacficing the quality of content and learner comprehension? We are proud to announce that we have recently been awarded Aurora awards for our new Infection Control & Prevention Series as well as our Vehicle Extrication series. The Aurora Awards is an international competition designed to recognize excellence in the film and video industries. It specifically targets products, programs and commercials that would not normally have the opportunity to compete on a national level, by focusing on non-national commercials, regional or special interest entertainment and corporate sponsored film and video. Entries have come from across the US, and abroad (such as Russia, Denmark, Hong Kong, Germany, Australia and Mexico). Action Training Systems’ 3-title Infection Control & Prevention series provides a systematic understanding of bloodborne, airborne, and other diseases of concern to emergency responders. These programs demonstrate how to minimize or prevent the spread of diseases through proper precautions and infection control practices and how to mitigate an exposure to communicable diseases. As a series, it provides a comprehensive framework to help instructors fulfill initial and annual infectious diseases training requirements. The Vehicle Extrication series includes 10 training programs that teach to the current National Fire Protection Association standards, including NFPA 1001: Standard for Fire Fighter Professional Qualifications, NFPA 1006: Standard for Technical Rescuer Professional Qualifications and NFPA 1670: Standard on Operations and Training for Technical Search and Rescue Incidents. The programs cover step-by-step extrication evolutions, basic operational procedures and knowledge of tools and techniques used to complete an efficient and effective extrication. 5. Be weary of template narratives. The reviewers want to hear "your" story. 9. EMS trained to BLS level asking for ALS equipment. Make sure to only apply for equipment that your staff are "currently" trainined to use. The documentary that many believed would never be finished finally premiered this week. BURN: One Year on the Front Lines of the Battle to Save Detroit first premiered at the 2012 Tribeca Film Festival in New York on Tuesday with more film dates scheduled throughout the week. The newest trailer for the documentary recently played at FDIC, where Director/Producers Tom Putnam and Brenna Sanchez lead a Q& A about the film. Famed actor and “Rescue Me” star Denis Leary also contributed to the documentary as executive producer along with Jim Serpico, who co-founded the production company Apostle with Leary. Putman and Sanchez followed the members of Engine Company 50 on Detroit’s East Side as they served their community. They used helmet-mounted cameras to see from the perspective of the firefighters as they put their lives on the line, but the most interesting part of the story is told through the interviews with crew members. As you get to know the crew, you see how they deal with the problems common to all fire departments, but on an extreme scale that is no longer sustainable. Despite the bleak odds in as fire calls increase and budgets decrease, the message of the documentary is clear: the community keeps Detroit strong, and that is always worth saving. This isn’t surprising considering the high number of foreclosed and abandoned homes in the Motor City area. This issue also made national headlines earlier this week when Detroit’s Executive Fire Commissioner Donald Austin said that allowing abandoned buildings to burn to the ground is one option to consider in the face of a 15% budget cut. The proposed plan would allow some vacant buildings to burn if they're more than 50% consumed, but only if the fire does not threaten inhabited structures and weather conditions are favorable. These structures often cost more to tear down or salvage than they are worth, so allowing them to burn may be an affordable, albeit desperate, solution. This idea raises controversy because many abandoned homes and buildings may be providing shelter to homeless individuals or even families. However, abandoned structures pose a greater risk to firefighters because they are often left in dilapidated conditions with a higher chance of collapse. The case of Walter P. Harris, a 17-year veteran for the Detroit Fire Department who was killed when the roof collapsed during an abandoned house fire in November of 2008, exemplified this risk in the documentary’s extended trailer. The fire that killed Harris was also reported as intentionally set. To learn more about the BURN documentary or make a tax-deductible donation to the project, visit the Official Burn website at http://detroitfirefilm.org . What do you think of the documentary? Should fire departments allow abandoned buildings burn to cut costs? Let us know your thoughts in the comments. Discouraged because your 2011 AFG training request was denied? Are you discouraged because your 2011 AFG training request was denied? Don’t give up! Grant funding for training projects is not dead. Many fire departments are frustrated that they were not awarded a training grant for 2011 and may not apply for training this year, or not apply at all. If your department has a training, equipment or apparatus need, we urge you to keep trying! Action Training Systems has some tips to help you successfully ask for training in 2012. 1)Make sure your training request matches the grant priorities. Nearly every successful AFG funded training project demonstrated in the request that the program outlined was instructor led, incorporated evaluation and testing, and led to student certification upon completion. To be successful, you must outline your entire training program, not just training materials you need to carry out that program. You must show how your certified instructor will use the requested training materials as part of a program that includes getting students in the classroom seats and delivering quality hands-on training leading to certification. The AFG reviewers like to see that you have a training plan, not a wish list. You must indicate how trainees will be evaluated and tested in your program to demonstrate their competency. Action Training Systems offers several instructional aids that are necessary to meet the goals of developing effective emergency responder training. These include instructional DVDs and CBTs to complement instructor led Firefighter I/II, Driver Operator, HAZMAT Awareness, HAZMAT Operations and EMS course delivery; PowerPoint programs for all levels of firefighter and emergency responder training; a full line of IFSTA manuals and student workbooks necessary for effective delivery; Brady/Pearson EMS books and, a comprehensive test-generating program for student applications and evaluations. Successful AFG awards, especially those for training, require planning thought and preparation. Action Training Systems has over 24 years of experience in developing courses for emergency responders. Action Training Systems has a key understanding of the industry, the adult learner and of instructional design, placing our programs at a superior advantage over other training products in the market. Action Training Systems has aided thousands of fire departments worldwide in meeting their training needs. Contact our expert technical staff at 1-800-755-1440 for your training support needs. © 2014 Action Training Systems, Inc.